Mission: The Volunteer Council in partnership with the League of American Orchestras strives to lead, advocate, encourage, support, and serve our member orchestras and their volunteers. Trivial Pursuits with a Higher Purpose? For most, spring symbolizes renewal and rebirth, but in the world of symphony, fall is the season in which we anticipate a most delightful reawakening of our senses. Our orchestras’ new seasons, planned years in advance, are just now coming to fruition. And each fall, we volunteers renew our commitment to help keep the music playing. After planning for a year or more, symphony volunteers across the country are in full flight with fall events – opening night galas and designer showhouses, to name just two of the myriad ways in which we support our symphonies. Undoubtedly, the Volunteer Council exists to serve and support your volunteer efforts. Our online resources are unparalleled. For instance, the Gold Book is a state of the art, national project reference database containing detailed descriptions, financials, volunteer requirements, and contact information dating from 2005. The submission period for projects taking place in 2014-15 has just come to a close. Our deepest gratitude to all of our contributors who dedicated their time to share their organization’s intellectual property and success with their fellow volunteers. We don’t rest on our laurels. We constantly seek to keep our services and resources relevant to the needs of volunteers everywhere. However, our ability to serve you requires reciprocity. In order for us to be truly responsive, we need a one on one connection with you and your organization. We cannot do this without your help! So, when a member of the Volunteer Council contacts you, please share your successes and challenges. Better yet, reach out to us with your story. It’s easy – just click here! Your valuable input shapes the path forward, as we renew our commitment to providing you with the very best in volunteer resources and support. … while Baltimore’s Inner Harbor, where the Conference hotel is located, is a bustling commercial district full of restaurants, hotels, and retail establishments. We look forward to hearing the internationally renowned Baltimore Symphony Orchestra in concert, under the direction of Maestra Marin Alsop. The BSO is celebrating their 100th anniversary season, and we plan to laud this achievement with them. For a more in depth look at the Baltimore Symphony, check out this recent article from Baltimore Magazine, with quotes from Jesse Rosen, president and CEO of the League of American Orchestras. Additionally, the BSA (Baltimore Symphony Associates) stand ready and willing to assist with Conference preparations. Last but not least, Conference attendees should plan on tasting those delicious crabs! We will be in Baltimore just as the heart of crab season gets underway. Volunteer Council begins our planning during the fall with the selection of Gold Book and Roundtable winners. Thank you to all those organizations who submitted to the Gold Book this year. We all gain so much from sharing with other volunteer associations. Council members are also engaged in various aspects of Conference programming, dine-arounds, and networking. It is our hope that symphony volunteers will learn to prepare themselves for the reality of today and the unknown possibilities of tomorrow. Online registration and hotel reservations (Baltimore Marriott Waterfront) will open in early 2016. See you in Baltimore!! *Please note that the main dates of Conference, June 9-11, 2016, are a Thursday – Saturday (this schedule is different than our recent conferences). Additionally, there will be some pre-Conference volunteer activities beginning on Wednesday, June 8, 2016. Volunteer Annual Giving Campaign Goal Reached! Heartiest congratulations and our sincerest thanks to the 81 volunteers (and volunteer supporters) from Spokane, WA, Canton, OH, Charlotte, NC, and many other cities across the continent who helped us to surpass our goal by donating $45,360.00 to the League’s Annual Fund this fiscal year! By September 30, we had exceeded our goal by 13%! We would like to especially recognize Laura Hyde, immediate past president of the Volunteer Council who hails from Tyler, TX, for her campaign leadership as well as Shirley McCrary, a volunteer from Mooresville, AL, who donated $5,000 as a challenge match to help us reach this goal. Donations this year enabled the League to provide invaluable resources, networking, and advocacy for all our orchestras. From the National Conference in Cleveland to Gold Book, Volunteer Notes, Symphony magazine, and more, the League champions North America’s orchestras and their volunteers. For the new fiscal year that began October 1, we will again tackle a $40,000 annual giving campaign goal for volunteers. One of the Volunteer Council’s most important priorities under consideration is to expand the League’s Noteboom Governance Center educational programs to include volunteer association. The skills and experience that volunteers bring to their associations and their orchestras can be the difference between success and treading water. True or False: Re-evaluating and updating job descriptions every year is invaluable to keeping these important documents relevant. Multiple Choice: According to recent research, which of the following defines the 21st century volunteer? wants to make a difference in an organization. Discuss: Which area in an organization should be charged with identifying future leaders? Questions like these abound in this year’s new board game, The Golden Mean to Memorable Membership Results, created by the Volunteer Council. Introduced at the League’s 2015 Annual Conference in Cleveland, it was an instantaneous hit with our volunteer delegates. Along the way to winning, knowledge about membership recruitment, mentoring, retention, and development is imparted. Group discussions are prompted and are often quite lively. 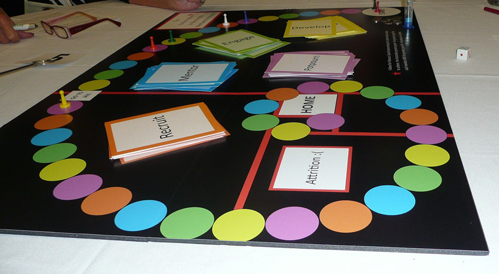 Players travel a colorful spiral game path and are required to answer question cards based on color-coded landing spaces – orange for recruitment, blue for mentoring, green for retention –you get the picture! And, there is, of course, a trip to the jail for those unlucky board travelers. Conceived as a companion piece to the Leadership game, Chart a Path for Leadership Season by Season, which was introduced in Seattle in 2014, downloadable files for recreating the new Membership Game are available online on the League’s 2015 Conference Materials site. Files for The Leadership game can be found here. TRUE: Subtle changes can become monumental disconnect quicker than one might think. Ask your committee chairs to review their job descriptions and include any revisions in their year-end reports. Including a timeline of activities is very helpful where possible. D) 21st century volunteers do not want to be micromanaged, will volunteer for multiple organizations, want flexibility in their schedule, and wants to make a difference as a result of their work, not just a contribution. Traditionally, this is a role for Nominating. However, other committees can be formed to oversee this critical function. The important thing is that this is ongoing and well documented. Your future depends on it! The League of American Orchestras’ online resources are unparalleled for symphony volunteers. The Volunteer Council, in conjunction with League staff, has developed webinars on fundraising, membership, strategic planning, social media, and leadership to address many of the challenges facing our organizations across the nation. All are easily accessed and free. These online presentations are narrated by Volunteer Council members in an easy to understand format which viewers can follow at their own pace. To sign up, simply go to the League website’s volunteer webinar page to view your choices of topic. Once you submit your selection, you will receive an automatic email from the League granting you access to view the actual webinar, plus the script and a .pdf of the PowerPoint you can browse. Planning is currently underway to create a new webinar – a how-to for making great Gold Book submittals. We will include explicit instructions about the online submission procedure itself (the mechanics), as well as an overview of what information every good submittal includes. Pairing the new webinar with the League’s new Gold Book website will fulfill the Volunteer Council’s vision to enable volunteer knowledge sharing on an unprecedented level via an almost effortless submittal process. Look for our new webinar next spring – in plenty of time for Gold Book submittals for the 2015-16 season!